Context: Finished this off in a brand new armchair at my mate’s house. Gorgeous chair from Marks & Spencers. Perfect for reading in. Fifty pages into this, I was wishing I hadn’t started it. Fifty pages from the end, I was wishing I wasn’t finishing it. There are two readers who would love this book: people who lived through the ’80s in the UK and those who want to know what it was like to do so. I fit into the former category… just and it was a great trip down memory lane in places. The novel follows the lives of three friends from a New Year’s Eve’s party at one of their houses through to sometime in early 1985. Their three quite different characters tied together by shared years at Cambridge. As Drabble rotated character by character, I couldn’t help but wonder if Atwood is a Drabble fan. 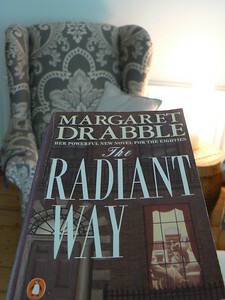 Atwood’s Robber Bride seems to have been written under the influence of The Radiant Way but I could be wrong. The characters go through various crises in their relationships, careers and/or environments and Drabble uses these to explore the raison d’etre of each. Throughout she masterfully weaves contemporary events of the 1980s into both the backdrop and foreground and if, like me, you can remember vividly most of the historical references, it’s a great trip down memory lane. New Year’s Eve, and the end of a decade.